The SB²-SMs Quantum is our new flagship for high-volume laser soldering with unrivaled, premium processing quality, “Made-in-Germany”. It introduces a dual-drawer system and a vision process, which is done in parallel to the soldering process, thereby matching the loading and unloading procedures of the products with the soldering speed of the machine. This allows continuous production without stoppages due to necessary product loading/unloading procedures. The SB²-SMs Quantum brings contactless and fluxless soldering technology into 3D component soldering. 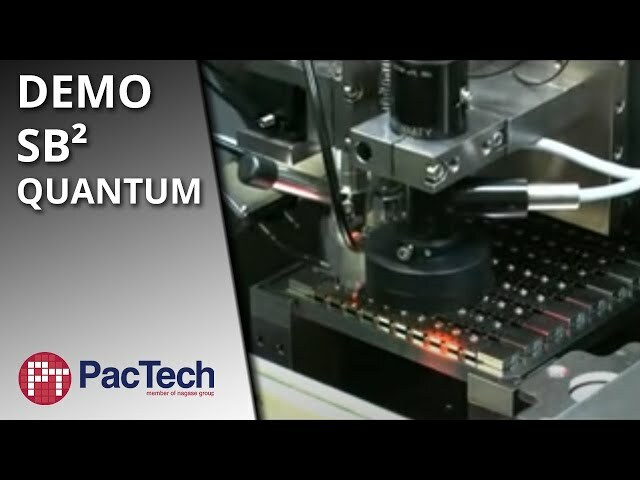 The SB²-SMs Quantum is a machine for automated sequential laser soldering, catering to a variety of different microelectronic devices, especially dedicated for camera modules, sensors, and optical devices. The system is capable to singulate, to position and to reflow solder balls with a diameter between 250 µm and 760 µm with a soldering speed of 6-8 balls per second.